Here at the Environment Agency we have the job of investing funding for Flood and Coastal Risk Management, working with local councils and water companies amongst others to put measures in place to protect people and property. As the Flood & Coastal Risk Manager for Cumbria & Lancashire part of my job is to ensure we build the positive working relationships with communities at risk. Any work we and others do to tackle flood risk needs to have the support of the local people involved. In some cases this is financial support, but for many it can mean they have an input into the design of the scheme. I’ve seen firsthand how we make better decisions when we take account of local opinions. Alongside home and business owners, we engage the elected representatives of communities, whether they be local councillors, MPs or Government Ministers. This is where I often get involved and increasingly so in the last 18 months. In recent weeks I've taken part in telephone briefings with Defra Ministers about local issues they have been contacted about as part of their Ministerial roles. 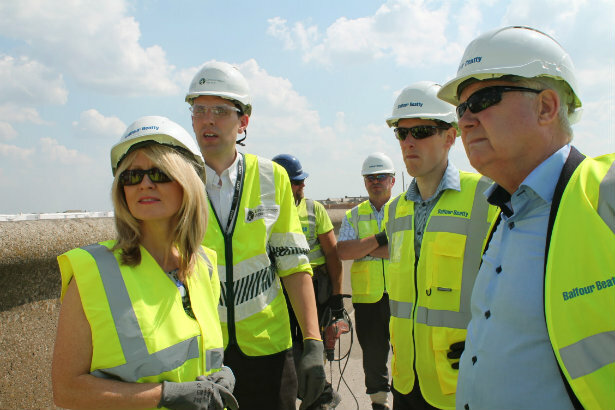 We've also had a number of visits to my patch, most recently the Rt Hon Esther McVey MP, Minister for Employment and North West Flood Envoy. In Cockermouth, Cumbria we showed the Minister around the innovative flood risk management scheme, including the self closing barriers, the first of their kind to be used to protect a community in the UK. While in Lancashire we showcased the award winning partnership between Wyre, Blackpool and Fylde councils; United Utilities and ourselves which is delivering an £86million improvement project which follows previous works in Cleveleys; Central Blackpool and hopefully future works in Lytham. In both of these visits we were able to demonstrate what can be achieved by working in partnership to deliver efficient, effective flood risk in the North West. I recently met the Rt Hon Dan Rogerson MP, Minister for Water and the Natural Environment with others from the Alt Crossens catchment in Lancashire and into Merseyside. We talked about how we are seeking to work together to manage water in a way that supports the valuable local agricultural economy, whilst ensuring our work is focused on those places where the greatest numbers of homes are at risk from flooding. Managing flood risk will continue to be a priority for the Environment Agency and as such I know that much of my time in the months ahead will involve conversations with MPs, councillors and Ministers on the tough issues faced by the communities they represent. I don’t always know how to resolve these issues, but I do know you stand the greatest chance of finding out by working with others. For information on our role in managing flood risk visit GOV.UK at: https://www.gov.uk/environmental-management/flooding-coastal-change. To check if you are at risk of flooding visit: https://www.gov.uk/check-if-youre-at-risk-of-flooding or contact Floodline on Telephone: 0345 988 1188 or 0845 988 1188 (24-hour service). Andy Brown is a Flood and Coastal Risk Manger for Cumbria and Lancashire. Andy has worked for the Environment Agency for 17 years in various roles and works between the Penrith and Preston offices.